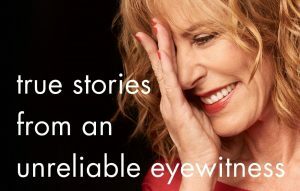 Join us as Christine Lahti celebrates her book True Stories from an Unreliable Eyewitness: A Feminist Coming of Age; she will be joined in conversation by documentary filmmaker and author Michael Moore. Lahti’s insights are personal, yet not exclusive, with her sentiments spanning generations. Her writing can be seen as a spiritual mother to feminist actors and voices whose work inspires today’s young women. Her memoirs show a journey toward empowerment as a woman—a journey that she is still taking. Christine Lahti is an acclaimed director and stage, television, and film actress with a career that spans over forty years. She won an Oscar for her short film, Lieberman in Love, two Golden Globe Awards, and an Emmy Award for Chicago Hope. On Broadway, she starred in God of Carnage and The Heidi Chronicles, among many others. Some of her films include Swing-Shift, Running on Empty, and Housekeeping. Michael Moore is the Oscar and Emmy-winning filmmaker of Bowling for Columbine, Roger & Me, and Fahrenheit 9/11, and the New York Times best-selling author of Stupid White Men and Here Comes Trouble. His groundbreaking NBC series from the early ’90s, TV Nation, brought political satire back to television where it had been absent since the days of the Smothers Brothers. He was at one time the youngest elected official in the country and, according to President Trump, “twice had dinner with me” — though Moore has no recollection of either date. This event is presented by The Strand Bookstore in partnership with The New School as part of the See Me After Class series.